Despite the cold temperatures, our dogs still need to go outside for walks, run around in the yard, or at the very least… do their business. As a result, our pets are coming into contact with ice melter in some form or fashion. In this article, we try to highlight some of the key points that we have discovered when it comes to pet safety and ice melters. Is there a pet safe ice melter? There is no perfect solution that both melts ice and is 100% safe to pets, but there are some safer options for sure. In general, “pet safe” ice melt will exclude rock salt (sodium chloride) from its ingredient list. Because of its harsh texture, rock salt will cut or scrap dog paws more so than other ingredients. 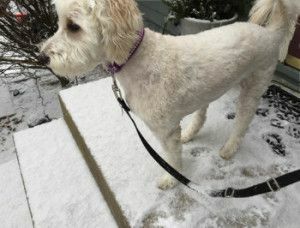 We have a few salt-free ice melters, but the safest one is the Sure Paws product from Safe Step. This product is a mixture of only two ingredients, magnesium chloride and potassium chloride, which are more gentle on pet paws and do not cling to the feet as much. Can irritation be caused from other products? Prolonged contact with “safer” ingredients such as calcium chloride or magnesium chloride can cause the pads on their feet to dry out and become irritated. A dog’s feet dry out because of the natural moisture absorbing qualities of these safer ingredients. It is best to wipe your dogs paws when they come inside to be sure that these products don’t linger around on their feet. Is there a way to provide traction, without melting snow? There are some new products that only provide traction. We sell a product called EcoTraction which has been really popular for those with new concrete or stone work, as well as those with pets. Its naturally gritty texture embeds into snow and ice to prevent slips and falls. And its characteristic green color allows you to see where it has been applied and where it may need to be reapplied. All things considered, these are the suggestions that we have to help keep your pet safe this winter! Prevent ingestion of dangerous products, especially anti-freeze that might have dripped from a car. Keep ice melters out of the reach of pets or closed in a tight-fitting storage bin. Consider using a product such as Musher’s Secret. This is a all natural wax that protects paws from the cold of snow and ice and prevents them from drying out. Simply use on a weekly basis.